NASHVILLE, Tenn. – The United Soccer League formally welcomed its new Nashville franchise to the league today in a downtown public celebration that included Nashville Mayor Megan Barry and the team’s ownership group. 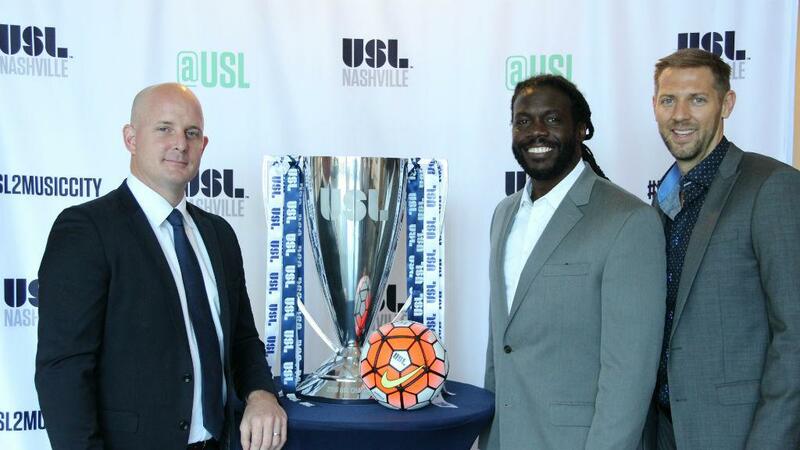 The franchise revealed that the team would be known as Nashville FC and would immediately begin accepting ticket deposits for its inaugural 2018 campaign. USL President Jake Edwards presented Barry with a No. 7 USL Nashville 2018 jersey signifying her position as the seventh mayor of Metropolitan Nashville and officially awarded the Nashville FC ownership group – LifePoint Health President and COO David Dill, Provider Trust co-founder Chris Redhage, and Marcus Whitney, the founder and president of Jumpstart Foundry – league membership in a festive ceremony at Bridgestone Arena. The new Nashville FC USL team approached the amateur, supporter-owned club about acquiring the Nashville FC brand after announcing in May they had been awarded a USL franchise. The club’s members voted overwhelmingly to approve the brand purchase in exchange for a 1 percent equity stake in the USL team and a voting seat on its board. The Nashville FC crest features the blue and gold colors of the Metro Nashville city seal with the overall shape and formation of the circular “N” along with a small center circle representing a spinning record, paying respect to Nashville’s “Music City” heritage. The fleur-de-lis also comes from the city seal, and the circle band encompassing the logo features a “divide” that represents the numerous Civil War battles that took place in the region. A $25 deposit will entitle purchasers up to four season tickets that will include 18 games. The team is also accepting $50 deposits for premium season tickets that will include 18 games. Deposits are being accepted exclusively on the team’s new website at www.NashvilleFC.com, which immediately becomes a part of the USL Digital Network. Nashville Predators President and CEO Sean Henry was on hand to promote the growing relationship between the two clubs, and Barry remarked on soccer’s incredible growth in Nashville. Nashville FC will be part of the USL’s national footprint that features a schedule focused on building regional rivalries that for Nashville supporters will include USL teams in St. Louis, Louisville, Charlotte and Cincinnati. The Nashville FC franchise will make more announcements in the months ahead of its 2018 inaugural season, including updates on facilities, personnel and community outreach.